Real American Hero Jack Mannigan (Nichols) assembles a team of fellow “American Wardogs” to overthrow an evil dictator (is there any other kind?) in the Central American country of Cenagua. Their mission also requires them to save four American hostages and recoup crates of guns. The target is General Alfuero (Monty), and Mannigan’s team consists of Hang Sang Kook (Tsai), Frank Stack (Anderson) and Bill Peters (Moss). Machine guns will be shot. Jungles will be trekked through. Huts will explode. Will Mannigan and his team achieve their mission? Find out today! As indicated above, Mannigan’s Force is a combination jungle/Exploding Hutter crossed with the ever-popular “El Presidente” theme of the day. What sets this movie apart, if anything, is the complete and total lack of anything even remotely resembling character development, or even plot development. It’s just shooting, blow-ups and other violence, for its own sake. And when it comes to the opening of the film, it totally works. It may not scale the awesome heights of the opening of Phantom Soldiers (1987), but really, what could equal that? This is, in its own way, a triumph. Watching an oiled-up George Nichols (is there any other kind?) screaming while firing two machine guns in slow motion is worth the price of admission right there. But, inevitably, there is a slowdown later in the movie and things get dull. Luckily it doesn’t really stay that way, it’s more of a roller-coaster kind of situation. George Nichols (here credited as George Nicholas) of Sakura Killers (1987) fame is truly a treasure. It’s a shame he kind of got lost in the shuffle during the 80’s action boom. When everyone from Sylvester Stallone to Edward Albert were shooting, kicking and car-crashing away, Nichols should have had more time in the sun. But the market was very crowded then. Only now, with the passage of time and the advent of the internet, can action fans see another contender for the meathead throne. Perhaps only Nichols, manly as he is, can play a character named “Mannigan”, who’s undoubtedly all man - again. Speaking of names, the movie was directed by a man named John Ryan Grace, in his only credited movie work. It’s a shame, he should have done more and developed his talent. Interestingly enough, in his credit on the movie itself, the “Ryan” has an apostrophe and is “R’yan”. How is that supposed to be pronounced, “Err-yan”? Maybe it’s lost in translation. And even Mike Monty as the General is here Mike “Monti”. While we always love seeing Monty, Mannigan’s Force really belongs to the great George Nichols. 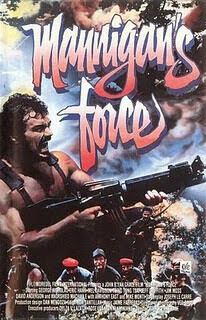 For utterly brainless Exploding Hut fun, it’s hard to beat Mannigan’s Force. LOL! Hopefully it does and you can bask in all the exploding huts! I which movie has the record for most exploding huts? Haha, that is a good question...maybe Phantom Soldiers. What about Beyond The Call Of Duty? another great movie! the wish list never ends with your blog!!!! i should go out vhs hunting asap! Venom: Trying to remember, but that did have a lot of huts exploding. Oeioc: Thanks! If you do go VHS hunting, definitely drop by and tell us what you bought. Thanks, Jack! That is really cool you that version. You have an amazing collection. We will be showing pictures and videos from our collection soon. Thanks, mate. Judging from this blog your own isn't so bad either. LOL. PS: Sorry about the comment from "Bamse". I'm on my dad's wife's computer and didn't realise her profile was turned on. Haha.